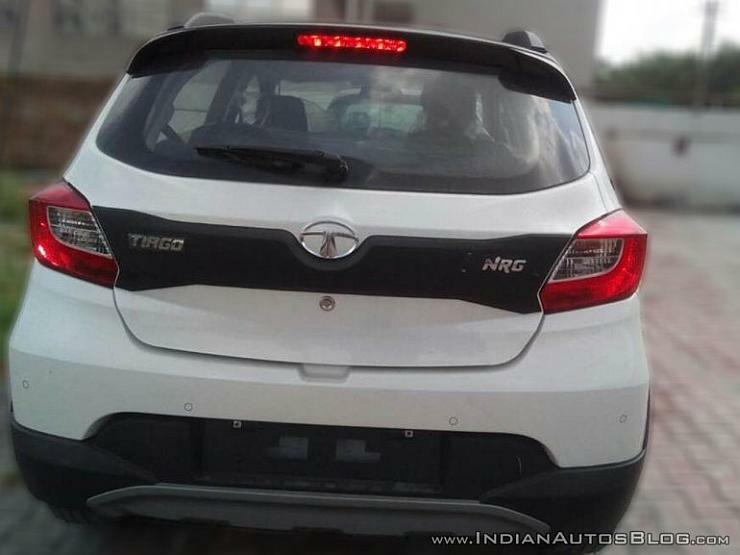 The Tata Tiago NRG (Energy) that is all set to be launched today, has been spotted in its undisguised form hours before the launch. The pictures reveal the front, rear and side profiles of the NRG variant. The NRG trim is the crossover variant of Tata Tiago. Just like every other crossover vehicle on sale currently, the Tiago NRG also gets thick side cladding and wheel claddings which make the car look bulkier. The front bumper gets a faux skid plate. The automaker has used black trim inserts on the front grille and rear boot instead of chrome to give a monochrome look to the vehicle. 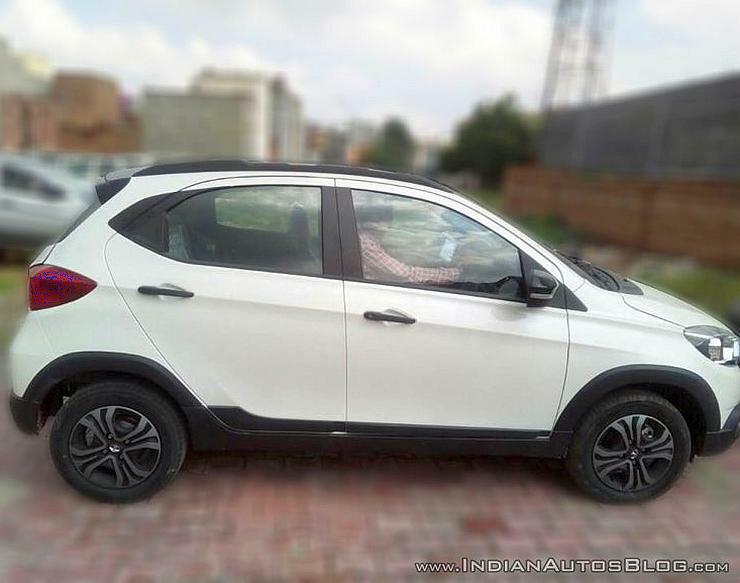 The side cladding makes the Tiago NRG look like a mini SUV. The car gets a ground clearance of 180 mm, which is 10 mm more than the standard variant. The top-end variants gets the blacked-out treatment with black roof, black roof cladding and black rear spoiler to add more to the white-black contrast. Apart from the exterior, the interior also gets a new colour theme. The upholstery on the NRG variant gets a grey shade and contrast comes from orange stitching. 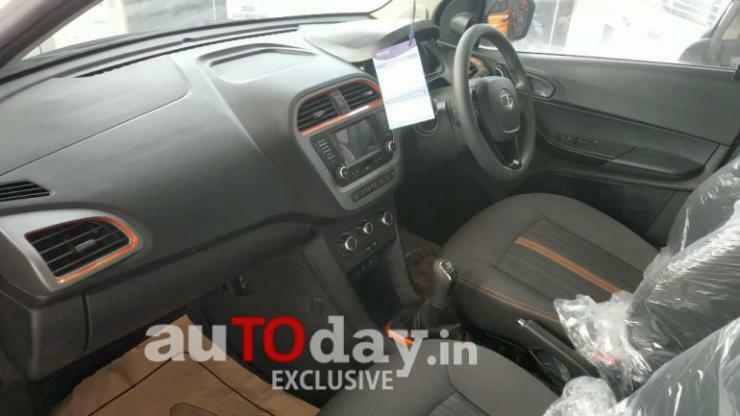 The dashboard also gets the grey-and-orange finish on the trims with features, such as the 5-inch touchscreen unit with 3D navigation system, Harman audio system with 8-speakers (first in the segment), 6-way adjustable driver seat and air cooled glovebox. The Tata Tiago NRG will be powered by the same engines that are available on normal variants. It will be offered in both petrol and diesel options. The petrol engine is a 1.2-litre Revotron unit, which churns out a maximum power of 84 Bhp and 115 Nm of peak torque. The diesel variant will be powered by a 1.0-litre Revotorq engine, which outputs a maximum power of 69 Bhp and 140 Nm of peak torque. Both engines get 5-speed manual transmissions as standard. The Tiago NRG will take on the Maruti Celerio X. Tata is expected to launch Tiago NRG at a price premium of Rs. 40,000 – Rs. 50,000 over the standard variant. 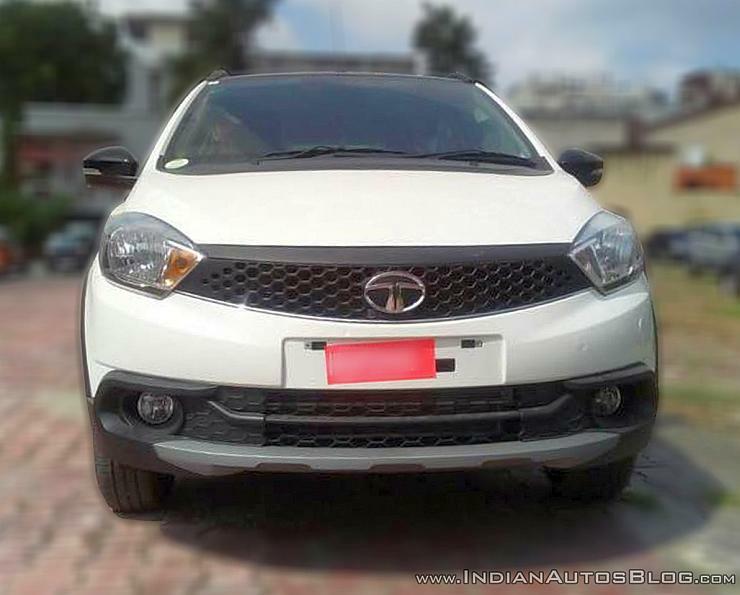 Currently, the Tata Tiago’s prices starts from Rs. 3.35 lakhs (ex-showroom) for the base, going up to Rs. 6.00 lakhs (ex-showroom) for the top-end trim.